CCD imagers will find that Baader's new Narrowband 7nm H-Alpha pass filter delivers the absolute highest contrast deep sky images of H-II regions, all with the shortest exposures possible. Its narrow 7nm FWHM bandwidth has a transmission at H-Alpha of over 90%, while completely rejecting light pollution. 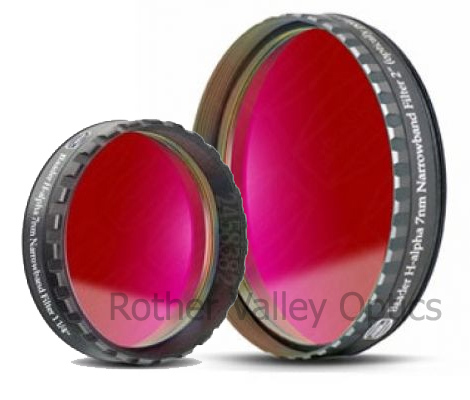 The high optical quality of the Baader 7nm H-Alpha filter guarantees no loss in sharpness or contrast. Each substrate is fine-optically polished plane parallel to deliver a smooth and accurate 1/4 wavefront over the entire surface. This special custom polishing operation sets Baader filters apart from the standard precision polished filter substrates used by most other filter manufacturers. Coatings are professionally applied by the most sophisticated equipment available, ensuring high consistency for bandpass centering and transmission. The ultra-hard ionbeam deposition ensures the coatings will never degrade from use or normal cleaning.